BRIDGEPORT, Conn. – March 20, 2016 – Connecticut’s Beardsley Zoo joins #LoboWeek from March 26 to April 1, an annual effort to educate people about the importance of wolves on the landscape of the Southwest, and the efforts to successfully return them to their ancestral home in the wild. #LoboWeek this March marks 19 years since 11 captive-reared Mexican gray wolves were released into the wild in Arizona and New Mexico as part of a federal reintroduction program under the Endangered Species Act. Missing from the landscape for more than 30 years, returning the Mexican gray wolf, or “lobo” to the wild was a significant milestone for the lobo and wildlife conservation efforts. More than a million wolves were killed in the U.S. between 1850 and 1900. In 1907, a call was made for the extinction of the entire species. Throughout the wolf’s history, they have been hunted and reviled due to fear and misunderstanding. The Zoo is home to two Mexican gray wolves, and two Red wolves, all extremely rare and on the Endangered Species list. Learning opportunities and activities for guests will be held all week. The two Mexican gray wolves at Connecticut’s Beardsley Zoo are sisters, born in 2007 at the California Wolf Center in Julian, Calif. Together with the Zoo’s two Red wolves, one male named Harper, and one female named Shy, they are part of the Species Survival Program (SSP), a breeding and management program designed to preserve the long-term sustainability of captive-based animal populations. The Mexican gray wolves and Red wolves are two of the rarest mammals in North America. Both species at one time were completely extinct in the wild. The Mexican gray wolf (Canis lupus baileyi) or “lobo,” is the most genetically distinct lineage of gray wolves in the Western Hemisphere, and one of the most endangered mammals in North America. By the mid 1980s, hunting, trapping, and poisoning caused the extinction of lobos in the wild, with only a handful remaining in captivity. In 1998, a new chapter in the Mexican wolf’s history began, with a homecoming that changed the landscape. There are 300-400 Mexican wolves in zoos today, but only about 40-50 in the wild. The Red wolf (Canis lupus rufus) is a smaller, more slender cousin of the Mexican gray wolf, also known as the Florida wolf or the Mississippi Valley wolf. At the brink of extinction due to hunting and habitat loss, the U.S. Fish and Wildlife Service rounded up 14 Red wolves to be bred in captivity in 1980. In 1987, the first release took place in North Carolina, with a second release two years later in the Great Smoky Mountains National Park. 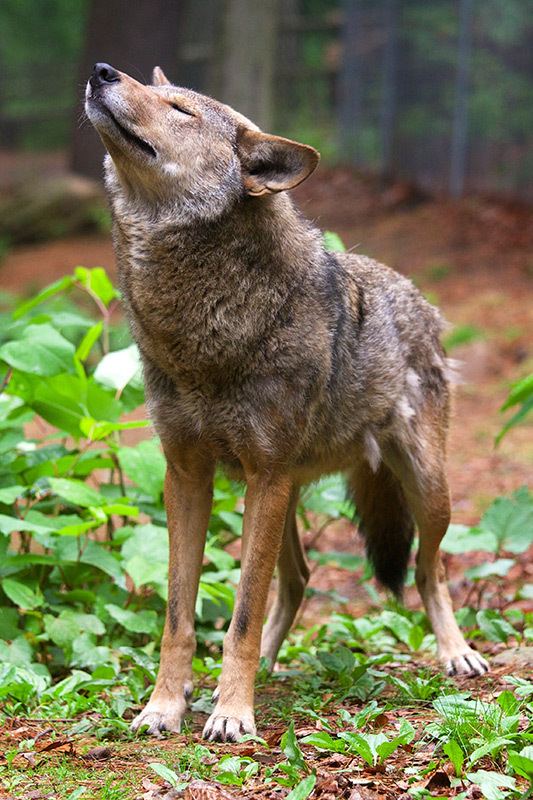 Fewer than 100 Red wolves currently live in the wild. All wolves are social creatures with an intricate system of communication and social structure. In the wild, a typical pack of five or six animals might consist of an adult pair and their offspring, with a territory encompassing up to several hundred square miles. Hunting behavior and strategies would vary with terrain. In areas where wolves and livestock co-exist, such as Minnesota, Montana, and Alberta, Canada, wolves take an average of less than one tenth of one percent (.1%) of available livestock. Wolves have been hunted down throughout the world, but pockets of wolves still exist in Spain, France, Italy, and Finland, as well as remote corners of the Middle East and on the Russian and Mongolian steppe. Wolves can live 14-15 years in human care.